OK, all you ALB lovers out there. I said I would do it, and I did. The Collector's Guide is now available for purchase. If you would like to get an idea of what info is in the guide, as well as how it is laid out, check it out here: Alcock, Lindley and Bloore Collector's Guide. You can also access PayPal from this page, and get information on other forms of payment. I sent a copy to Linda of "Handle and Spout", and she was very generous with her compliments. 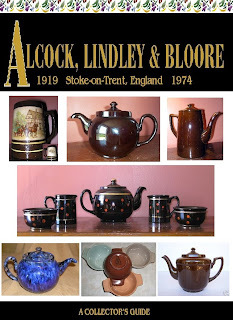 It is a light-hearted look at how I got started, why I love these teapots, extended info on the parent company (Swinnerton's Ltd), maker's marks, detailed indentification of ALB teapots, LOTS of full color photos and more. The Collector's Guide is great! It is clearly the result of extensive research as well as a great (and wholly justified) love for ALB teapots. I have been collecting ALBs for a few years, but your information on history and distinctive characteristics of ALBs was new to me, and will be very helpful. Your photography and the price guidelines are great ... in fact, you've inspired me to bid on 2 teapots on ebay today! Good luck with the guide! I am delighted that you approve! I'll send you updates when I get more info from Staffordshire.